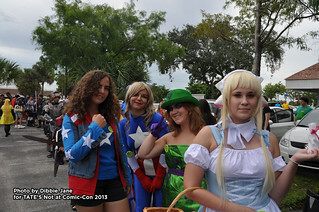 TATE'S Comics, Inc. By: TATE'S Comics, Inc.
Photo archive of the TATE'S Not at Comic-Con event! For those unable to attend Comic-Con International in San Diego, TATE'S holds a yearly event intended to give a "taste" of the con experience! These photos are from the 4th annual Not at Comic-Con event held at TATE'S. Events included: Line to Nowhere for swag and free stuff; the patented TATE'S Cosplayrade™ (a fun cosplay parade); Free copies of the TATE'S Local Indy Comic Anthology and artist alley; Worldwide Exclusive TATE’S Trailer premiere of “Golden Tate 4: Revenge of the Reptiles”; Nakia’s Xtreme Comic Trivia Challenge (with awesome Prizes from our sponsors) PLUS hectic good times and camaraderie, just like at the "real" Comic-Con!